An effective way to mark rooms and entrances with our projecting signs. Have text, images or graphics to both sides. Can be made to have changeable inserts or fixed graphics. Can be produced in colours to match the school colours. Our projecting signs will work both indoors and outside. 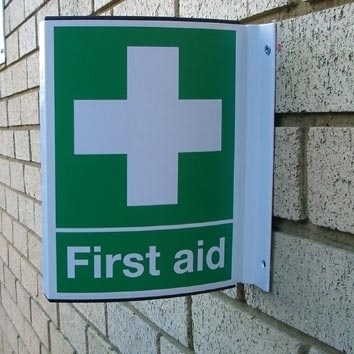 Made from extruded aluminium and are offered with a fixed text or graphic, or a changeable insert, these signs are an effective way to mark doorways and entrances that can be seen from the side or from within a confined space. These signs work very well in confined spaces because of the curved face. they are robust and made from extruded aluminium so that they don't rot or rust. The signs are available painted white all around and with the school colours as the background to the text or image. 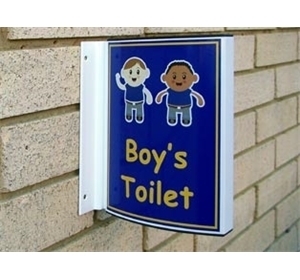 Supplied complete with fixings, these signs are easy to install.